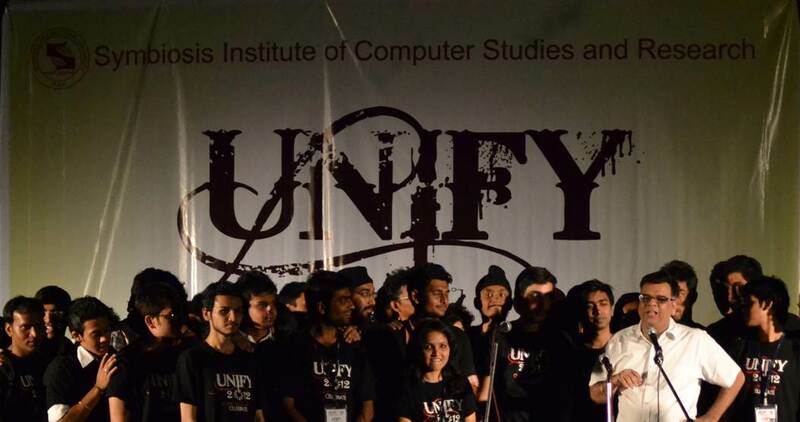 Symbiosis Institute of Computer Studies and Research did witness the biggest ever Unify this year. 2012 brought along so much glory to SICSR which we had never ever thought of. When I started working for Unify this year, it wasn't even one week past my surgery. When I had visited the first few colleges for unify promotion and registration, my stitches were very much alive inside my mouth. They did hurt but that never succeeded in reducing my enthusiasm even by a single percent. Today, after witnessing the success of Unify 2012, those pains and the hard-work seems to have served its purpose right. I have had never seen my college in so many colours, never heard louder cheers in this campus till this year's Unify. How Unify 2012,was is known all; so thought of sharing how the preparation of Unify 2012 hadbeen like. I still remember the first mail from Pushkar, asking us to be a part of Unify 2012, talking of December 2011, when it wasn't even decided whether we could make Unify inter-college this year. So many meets, so many debates... finally formed the Unify team. The actual struggle began after that, hunting sponsors, getting registrations....days spent without food, going around colleges, setting up registration desks in the most sunny and dusty possible areas of the visited colleges. The most horrible part was probably taking follow ups. Calling people and convincing them to be a part of Unify 2012. The registration was never over, until the events actually began, but when were left with no new college to visit, we had our own college to decorate and beautify. Hats off to the creative team!!!!! The college never looked this beautiful before. 17th morning began with an awesome opening ceremony and then when the three days were over, never got a hint of it. Today, sitting free at home, gives a feeling as if something is missing from life. Those beautiful days spent in the making of Unify is whats missing from life!!! I don't know if I will be fortunate enough to be a member of another Unify, but wherever I am, I will surely try and be present for future 'Unify's. The memories of Unify 2012 will always live with me forever..!! !